According to a recent report, Robert Pattinson has changed his cell phone number four times in order to avoid Kristen Stewart’s incessant calling! Oddly, one doesn’t imagine celebrities having cell phones and people calling them. It sounds strange to say it out loud, but celebrities are placed on such a glorious pedestal by their fans that one isn’t able to relate to their humanity. But even celebs have to deal with those annoying, unwanted phone calls and texts, and when you throw in a disgruntled ex-lover into the picture that’s when things get to be a handful. Oddly, one also cannot possibly imagine celebrities going cray-cray like normal people and crying in the bathtub like we do when The Bachelorette comes on the telly, so it is fun to imagine what a celebrity is like in their most vulnerable state — it is akin to repeating a word a hundred times and then not being able to recognize the repeated word. This is the case with Kristen Stewart, one of the biggest losers (no, not the overweight people crying in their homemade pies) since Steve Jones from the X-Factor season one. She is one of those celebrities that have become so over-saturated in thought and imagination that one is not able to recognize her silly face anymore. Allegedly, she has been phoning Robert Pattinson non-stop. Too bad you can’t vote them off the island, hey Rob? We would have paid with our souls to be at that Tribal Council. In other news, Kristen Stewart is still fumbling about like a guppy, in an ocean filled with piranhas and man-eating whores — Oh, right. Let us know in the comments below what you would do if you were Rob. 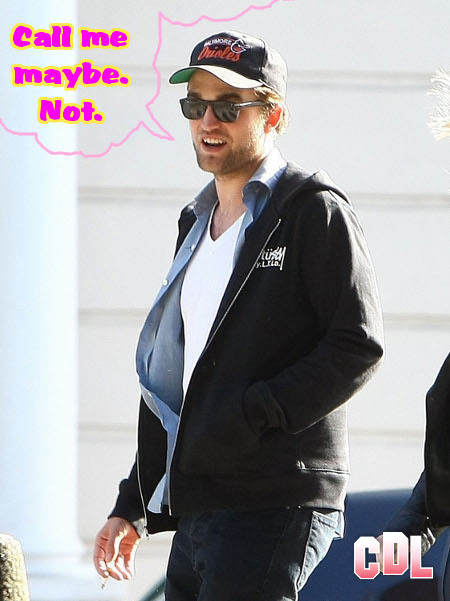 What do you think about Kristen Stewart stalking Robert Pattinson?